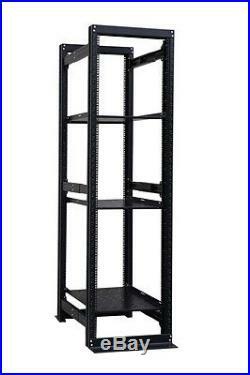 42U 19 4 Post Open Frame Adjustable Network Server Rack Enclosure w/ 2 shelves. This premium quality adjustable 4 post open rack is designed to accommodate different installations for equipment from different manufactures. The adjustable depth from 24"-36" is a great feature that will fit most of the server installation on the market. 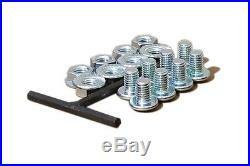 This rack is made of 1.5MM cold rolled steel to provide you with a maximum load of 900LB. With the heavy duty materiel, it provides your with exception stability. Screws and cage nuts are included. Two fixed shelves are included in the price. You can order extra in our store. Adjustable mounting depth from 24"-36". 4 post open frame with 4"X2.5"x6 steel base. 1.5MM cold rolled steel. We have order fulfillment centers throughout the US. International deliveries will take 1-6 weeks. Your complete satisfaction is our ultimate goal. If your return is the result of our error damaged, defective, incorrect item, etc. Raising Electronic Packaging Company includes three registered subsidiaries, which are Beijing Rising Wenguang Railway signal Equipment Co. Ltd, Shanghai Rishangsing Communication Equipment Co. Ltd and Rishangsing (Liangyungang) signal Equipment Co.
We are specialized in electronic equipment designing and manufacturing. Our main products include light-alloy enclosures, open racks, cabinets, card frames, Eurocard, sub-chiisi, panels and accessories. We provide structure design and manufacture, and also custom manufacture. We have export/import patent of products in our business field. The products are widely applied to many industrial areas, such as railway communication signal, aerospace, electronics, digital/simulation communication, biological identification, safety monitoring, etc. For a long time we have been provide products and service for thousands of company such as ABB, HMI, Siemens, Intel corp. China Aerospace Science & Industry Corp.
China Electric Power research Institute, China Academy of Railway Science, Tsinghua, Fudan, and more than two thousands of other High-tech companies. We played an important role in the sixth railway speeding and freeway constructions. After long years of supporting signal & communication corporations, we are confident about manufacturing and designing. In 2013 we established Raising Electronics. Inc in Silicon Valley, US and commence our journey to internationalizing. So far our products already own a great part of market in Northern America, and are imported to more than twenty developed countries globally. Rising group focus on developing high strength, light-alloy extrusion with precision machining methods. Strictly obeying IEC297-3, GB/T19520, we are experienced on developing, designing and manufacturing light-alloy enclosures and subracks. Rishangsing (Liangyungang) signal equipment Co. Ltd is the strong manufacturing plant for low quantity, quick and customized service aimed at scientific academy, university, and high-tech companies. We executive the same standard with many international mainstream hardware support suppliers, such as RITTAL, SCHROFF, ELMASEF, PENTAIR, VERO, etc. Also, some of our products are compatible. We used as many recycling, renewable and environment-friendly materials as we can in the process of design and development to avoid any direct or indirect impact to the environment. The item "42U 19 4 Post Open Frame Adjustable Network Server Rack Enclosure with 2 shelves" is in sale since Monday, February 9, 2015. This item is in the category "Computers/Tablets & Networking\Enterprise Networking, Servers\Racks, Chassis & Patch Panels\Rackmount Cabinets & Frames". The seller is "raisingelectronics" and is located in San Jose, California. This item can be shipped to United States.